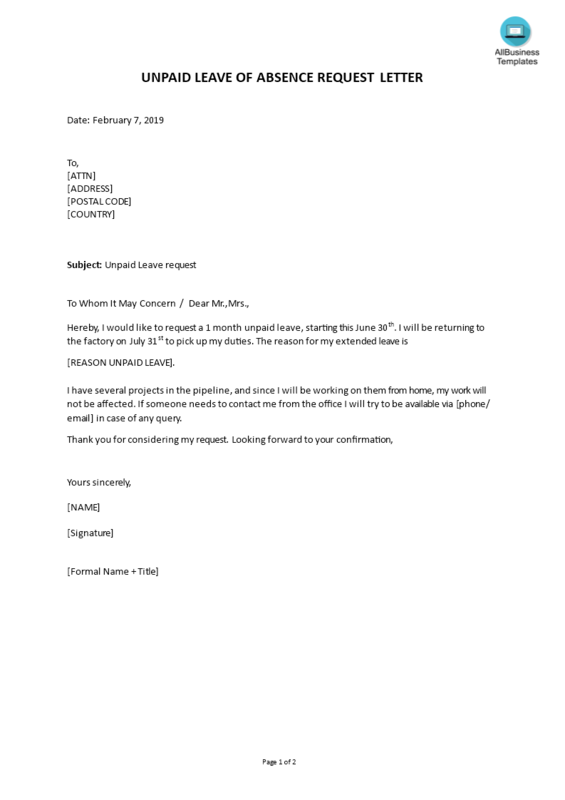 How to draft an Unpaid Leave Of Absence Letter? We provide a perfectly drafted Unpaid Leave Of Absence Letter that fits your needs! Sooner or later, at some point during your career, you may need to request a leave of absence from your work, due to a variety of reasons, for example: personal or health-related issues, birth or adoption of your son or daughter, a break caused by excessive work-related stress, inevitable loss of a person close to you or maybe just a strong desire to travel the world. Important to know: Other than for leaves covered by Family and/or Medical Leave Act (FMLA), military duty, jury duty, and some other particular circumstances, your boss is not required to approve your request for leave, nor is your company required to provide paid personal leave. What Is an Unpaid Leave of Absence? An "Unpaid Leave of Absence" (LOA) request is when you ask for a specific period of time off from your work and don't expect to receive a salary for the time you won't be at work. Depending on the company that you are working for, you may simply be able to ask for time off from your job shortly before you need it, or there might be a more formal process in place that you must follow to get your short leave approved. Make use of our unpaid leave letter template to help to come to a perfect personalized version. The objective of writing this letter is to request a period of leave for a temporary or permanent leave. It will mainly depend on the reason you apply for leave, whether or not you want to use a formal intonation. Whether the request letter is formal, or not, we advise putting the reason for the leave in the first paragraph of the letter's body. In the paragraphs following, you can use examples to support your main argument. In the final paragraph, you need to summarize the purpose of your letter again and suggest a suitable course of action to follow. Do not indent the paragraphs. But instead, leave an empty line between each paragraph.